In 1970, Ashbourne was just a small 400-person village near Meath's border with Dublin. But its proximity to the capital - the city centre is 20km away - made it popular among developers of housing estates catering to Dubs seeking more space and a semi-rural environment, leading the population to mushroom to some 14,000 people. 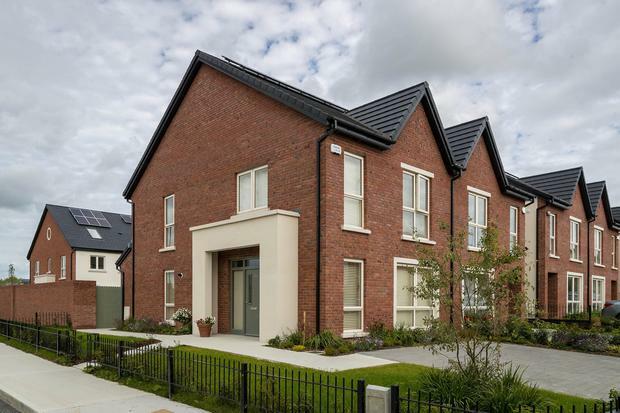 That trend continues apace with Churchfields, a development launched in 2016 near Ashbourne town centre that is attracting first-time buyers and growing families from Dublin. Some 270 homes have been sold since the launch of the scheme, which will consist of 300 homes when Cairn Homes has finished the development. Churchfields is set amid grounds landscaped with trees native to the area, and flowering shrubs, grasses and perennials to attract bees, butterflies and birds. Two new showhouses open this weekend to market a release of 20 three and four-bed houses at Churchfields. One of the showhouses is a three-bed mid-terrace style from the K2 house type and measures 1,210 sq ft, while the other is a four-bed semi-detached/end-of-terrace design spanning 1,463 sq ft from the C range. Both the K and C types have attics with trusses that have been made ready for a future conversion. Prices for the three-bed terraced style start at €330,000, and a semi-detached version with the same amount of accommodation is priced from €345,000. The four-bed terraced design costs from €360,000, while the semi-detached version, which also has 1,463 sq ft of living space, has a starting price-tag of €385,000. The front exterior of each house at Churchfields is finished in a red brick from Ibstock, with dashes of self-coloured render to some details, such as the porch around the pale green hardwood front door in some end-of-terrace styles. There is natural Portuguese limestone to the sills and surrounds of the double-glazed, cream-framed UPVC windows, which were designed to be lower to the floor than standard to maximise the flow of light into each house. To the front, there is a paved driveway. The rear paved patio and back garden can be accessed either by glass patio doors - or by a treated-timber side passage gate, in the case of the semi-detached house types. Inside, there are extra-high ceilings throughout the ground floor. The contemporary-style kitchen comes with glossy soft-close doors and drawers, integrated appliances, a peninsula unit, and a separate utility room. Stairs with a hardwood handrail lead to the first-floor accommodation, where there is a master ensuite, a family bathroom, and further bedrooms. There are fitted wardrobes in the bedrooms, while the main bathroom, downstairs WC and the ensuite have sanitaryware, tiling and heated towel rails. Other interior finishes include solid-timber painted doors, contemporary grooved architrave and skirting, and recessed LED downlighting in the hallway. The homes were designed to achieve an A3 BER, with the help of features such as a demand ventilation system that ensures a constant supply of fresh air into the home without letting the heat escape. Roof-mounted PV panels generate additional electricity, while an A-rated condensing boiler unit powers the heating, which can then be controlled at different zones. The running costs for homeowners at Churchfields are less than €2 a day for heating, hot water, lighting and ventilation, Cairn says, citing guidelines from the Sustainable Energy Association of Ireland. Ashbourne itself is close to the junction of the N2 and M2 motorway, providing a direct link to the M50. Viewings at Churchfields will take place tomorrow and Sunday, between 2.30pm and 4pm.